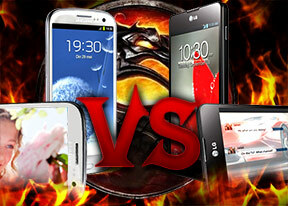 The two phones share a lot of similarities in their designs but they also differ quite a bit. The Samsung Galaxy S III is "nature inspired", so it's smooth and rounded, while the LG Optimus G is more industrial, with a rectangular look and all-glass build. We say all-glass because the back is covered with the same Gorilla Glass 2 material as the front. We should note that "Gorilla glass" is not actual glass, but a toughened transparent plastic, so when you tap it with your finger, it sounds more like plastic than glass. Anyway, the back of the Optimus G is interesting for another reason too - the pattern underneath the protective layer is diamond-shaped, but it reflects the light in such a way that it creates an illusion of depth. It looks as if it covered in a some kind of pyramid-shaped pits. The back of the Galaxy S III looks similar because of the hyperglazed plastic (hyperglazed means there's a transparent layer over the opaque plastic), but Samsung has made no claims about it being extra tough. The plastic below the transparent layer has either a brushed aluminum pattern or no pattern at all (it depends on which color option you get). To be honest, neither pattern will be everyone's cup of tea - the two materials are certainly not as cool as metal or polycarbonate. Still, we feel that the LG flagship is the slightly better looking of the and we are also willing to give it another point LG Optimus G for the scratch-resistant surface on the back. The Galaxy S III fights back with more color options. Moving to the front, we find two quite different displays - the Optimus G has a 4.7" screen with 15:9 aspect ratio, while the Galaxy S III has a 4.8" screen with 16:9 aspect ratio. However, as it turns out, the two screens have virtually the same surface area (it's within a percent). We'll cover the screens in more detail in the next chapter, for now we'll focus on the rest of the hardware. Other items of interest on the front are the Android keys. Both LG and Samsung have decided against using on-screen keys only (and they use Back/Home/Menu, instead of Back/Home/Task switcher). Anyway, the Galaxy S III has a hardware Home key and two capacitive keys, while all three keys on the Optimus G are capacitive. When it comes to buttons and ports, both phones are quite similar. They have the Power/Lock keys on their right and the volume rockers on their left. In terms of usability, we found no difference - buttons are easy to reach and comfortable to press. The volume rocker on the Optimus G is a bit unusual as it has a hump in the middle. That has a special purpose - it allows you to easily press both parts of the rocker simultaneously, which triggers the QMemo app. The ports are similarly positioned as well - a 3.5mm audio jack on top and a microUSB port centered at the bottom. Both phones also have mic pinholes on top and bottom, which are used for noise-cancelling during calls and for stereo sound recording in videos. The cameras on the back of both phones protrude, exposing them to risk of scratching. The Galaxy S III camera is in the center and the phone is more stable when placed on a level surface, while the 13MP shooter no the Optimus G is off to the side and the phone is more wobbly. The designs of the two phones diverge when it comes to battery and card slot access. The Samsung Galaxy S III has a removable back cover, which gives you access to the battery, microSIM and microSD card slots. This means you can carry a spare battery, easily change the original one when it starts to show its age and easily swap SIM cards. The LG Optimus G on the other hand has the back held into place by two screws. You could open it if you have the proper tools, but you can't do it on the go. The microSIM card slot also requires a tool to open, so swapping SIMs isn't quite as easy. Perhaps most limiting of all is the lack of a microSD card slot - you do get 32GB of built-in memory with the LG Optimus G and that's it. With the Galaxy S III you can have 16/32/64GB of built in storage and up to a 64GB microSD card on top of that (you can even get more than one card and exchange them when neccessary if you wish). Extending the longevity of the Samsung flagship is therefore easier with quick upgrades like a fresh battery or more storage. On the other hand, LG is promising an expanded lifespan (by more than 50%) on the Li-Po battery inside the Optimus G, so it will be longer before it needs a fresh battery. Having mentioned the batteries, we have to say that both have 2100mAh capacity and we'll take a close look at the battery life just as soon as we're done with this chapter and the screen comparison. The LG Optimus G is the more compact phone of the two shaving a few millimeters off the height and width and it's even 0.1mm thinner. Still, the LG flagship and the Galaxy S III are feel virtually identical when it comes to pocketability. The LG Optimus G is 12g heavier though, which combined with the lower volume of its body is enough to affect the in-hand feel. People who like phones with some heft will appreciate the added solidness, while others probably won't care too much about the difference.